Late last month there was an incident involving a Tesla Model S, and while there were initial fears of a safety issue, it seems more likely that the driver was at fault, although this has yet to be proven. However, the company cannot rest easy just yet because there is now a concern over the Tesla Model S battery. A couple of days ago there was a fire involving a Model S, and at first it was not known what had caused it, but an investigation has found the batteries were the cause of the fire, and this seems to have affected the Tesla (TSLA) stock price, as you can clearly see in the image below. 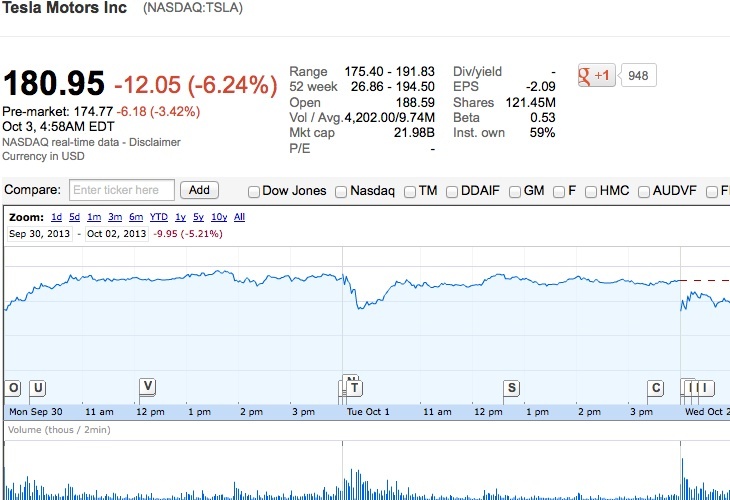 TSLA stock had been trading at $180.95, but as new spread about this incident share prices fell by $12.05. We will have to wait until later today to see if things will recover, but we have a feeling they will. We hear about fires happening in cars all the time, but because the Model S is using a technology some people do not feel comfortable with that is when all the bad publicity begins. Having said that, the fall in share prices could have been a coincidence because we know they have been heavily overrated. Autoblog Green reports that a large metallic object on the road had caused damage to the batteries underneath the Model S, which in turn set the vehicle alight. Thankfully no one was injured in the fire because the occupants had enough time to get out of the car. Thanks to the unique design of the Model S the damage was contained to one part of the car. According to the report the fire never entered the cabin, something that cannot be said for a standard vehicle running on gasoline. We do hope this is not the start of a witch-hunt because it is clear this was a freak accident, and no doubt Tesla Motors will be investigating the matters?